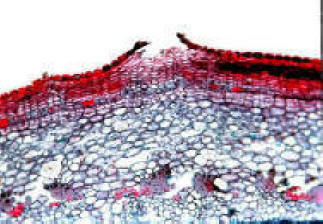 This micrograph shows a lenticel in cross section. The lenticel is filled with parenchymatous cells, through which limited gas exchange can take place. Lenticels are common in the bark of a tree, as these secondary structures replace stomata, that were present in the epidermis of the primary stem. Question: Name the parts of the periderm. What are their functions?